NED University of Engineering & Technology, Karachi. TechELITE is hosted by CIS department of NED University of Engineering and Technology and it is getting substantial with the pace of time. Inaugurated in 2007 with only 20 universities and 270 students participating, the number of competing universities has increased to 30 and the students to 351, to endeavor in the race for excellence to reach the utmost pinnacle. With 4000-5000 spectators and an efficient and impartial jury the students are judged fairly on the basis of their potential and aptitude. 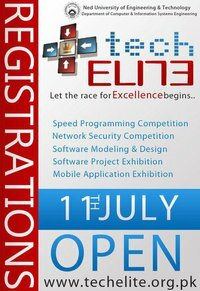 TechELITE invites the students from different Engineering Universities of Pakistan to display their expertise in the following four fields of IT sector. TechELITE provides the participants with a valuable experience which cultivates an increment in their talent as well as encourages creativity and builds innovation. In a world of augmentation of Information Technology TechELITE provides a platform for these emerging minds to share their innovative ideas with the professionals in a complaisant manner.